A meeting of the Russian and Azerbaijani delegations took place on Friday, Trend reports referring to the Azerbaijan's Ministry of Economy. 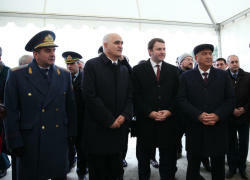 The Azerbaijani delegation was represented by senior officials of the Ministry of Economy, the Ministry of Transport, Communications and High Technologies, the State Road Agency of Azerbaijan, the State Customs Committee, the State Border Service and the executive authorities of Khachmaz and Gusar districts, along with the Azerbaijani Ambassador to Russia Polad Bulbuloglu. 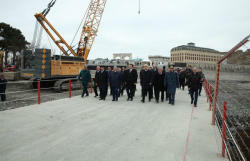 The Russian side was represented by a delegation including representatives of related structures, headed by the Minister of Economic Development of Russia Maxim Oreshkin, Russian Ambassador to Azerbaijan Mikhail Bocharnikov, and Head of the Republic of Dagestan of the Russian Federation Vladimir Vasilyev. The Azerbaijani Minister of Economy Shahin Mustafayev noted that the presidents of Azerbaijan and Russia attach great importance to the development of relations between the two countries, and the mutual meetings of the heads of state, official delegations and businessmen are perfect examples thereof. Mustafayev noted that Russia is the main trading partner of Azerbaijan and ranks first in the import of non-oil products of Azerbaijan. He said the trade between the two countries grew by 20 percent during the last year alone. 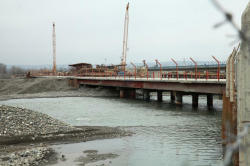 The minister spoke about the projects being implemented between Azerbaijan and Russia in transport and transit, and stressed that the construction of a road bridge over the Samur River is of great importance in the development of trade and economic ties, in the development of the North-South International Transport Corridor. Maxim Oreshkin noted that cooperation between the two countries, based on the political will of the presidents of Russia and Azerbaijan, keeps developing. 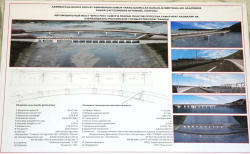 The minister noted the importance of the automobile bridge across the Samur River in terms of an even greater expansion of developing trade relations between the two countries and added that this would contribute to the development of the North-South International Transport Corridor. The expansion of trade and economic relations between Azerbaijan and Russia, cooperation in transport and transit, and the development of the North-South International Transport Corridor were topics of discussion during the meeting. 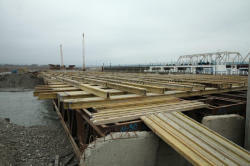 The Azerbaijani and Russian delegations examined the Yarag-Kazmalyar and Samur checkpoints at the Azerbaijan-Russia state border and got acquainted with the construction of the road over the Samur River. 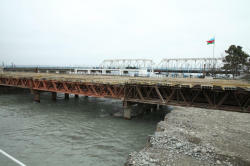 In accordance with the agreement signed between the governments of Azerbaijan and Russia, the construction of an automobile bridge over the Samur River at the Azerbaijan-Russia state border is ongoing. The bridge is scheduled to be commissioned in 2019.